I just finished watching all 13 episodes of House of Cards, the second season. Wow! I reserve my superlatives for only the best, and this is it. I give it 10 stars! But as I was caught up in the drama, I reflected on what the writers were doing and I could see lots of value for my own novel writing efforts. 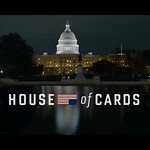 Netflix just released the entire 13 episodes of the second season of House of Cards. The story focuses on Congressman Frank Underwood and his wife Claire. At the beginning of the first season Frank was denied the Secretary of State post he wanted in the new administration, and he sets out to get revenge on the president he worked to elect. Claire helps him and they have trusted allies and enemies. While I don’t want to give away all the plot twists, I can give you some general idea of some of the learning moments I experienced. 1. Less is More. Subtle and understated is better. A few words go a long way. In one scene, a man is about to do something and he looks at his fiance and asks, “You think I’m weak, don’t you?” She says nothing. Very understated, but you get the message. It’s left to the viewer to decide. A few lines of dialogue with interruptions are enough to show us the tension between two of Frank’s staffers. We don’t need to be hit over the head with the message. 2. Breadcrumbs are teasers. Speaking of little hints, I love the breadcrumbs, little bits of scenes that give the reader an idea of something to come. Showing someone with a gun sets up tension in the reader’s mind. The reader wants to know, expects to know what is going to happen. House of Cards does this brilliantly. Characters get texts or phone calls and you’re not sure what they were about, but they are explained later. Or someone is in a scene and someone else is watching them but we don’t know who or why. These breadcrumbs keep us interested, as do asides in a novel or information we don’t know that we need. Just make sure the breadcrumbs amount to something later. This is the concept that, if you show a gun in the first scene, it must be used before the end of the book. Don’t tease readers without following through. 3. Characters are multifaceted. Frank and Claire Underwood are pretty bad people – or are they? We see them doing some bad things, but we also see them in some tender scenes together and we see them thinking about and doing some pretty touching things. That makes them human, and believable. Frank develops a new hobby based on his interest in the Civil War and his family’s history, and some of the pain in Claire’s past is revealed. This pain also shows us more about the relationship between Claire and Frank, which is complex and therefore interesting. Ruth Rendell, mystery and psychological thriller author, says, “I try, and I think I succeed, in making my readers feel sorry for my psychopaths, because I do.” The House of Cards writers have this figured out too. 4. Symbolism shows. Instead of telling us how Frank feels about his Southern roots, we see a symbolic gesture in what he does with a ring. A pair of cufflinks provides a moment of humor, but also a way to understand the relationship between Frank and another character. A birthday cake and how both Frank and Claire react to it shows more about their relationship. 5. Leave ’em guessing. Every scene, every chapter, in House of Cards has some tension at the end, something shocking, something unanswered, or some thought that leaves the reader on the edge of her seat. In a novel, even works that are not mystery or suspense, you can end scenes and especially chapters with danglers. The end of the season included a major plot resolution, but left lots of hanging questions that will – I hope – be resolved next season. I don’t like major cliffhangers at the end of a season or a novel because I think that’s unfair to readers, but a little mystery at the end of a novel is okay – it makes readers want to read the next one but doesn’t torture them for a year or more.